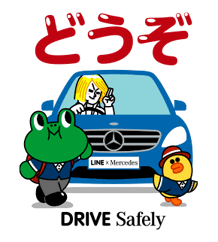 http://www.line-stickers.com/ – Drive Safely Line Sticker | Mercedes and LINE have teamed up to make the road a safer place! Put yourself in the driverʹs seat and remind your friends to drive safely next time you talk about going somewhere. Watch the video to get these stickers for free! Available till February 23, 2015. Sound will play when watching the video. Copyright : ©LINE ©Mercedes-Benz Japan. All rights reserved.